Our Mission: To teach people how to trade options the right way for long term success. Recently there has been a lot of hype around gold, and with it, the price of gold has increased. What most investors don’t realize, is that when gold prices rise, there is another way to make money off the shiny ore that often gets overlooked, but has a much larger rate of return. Back to that shortly, first let’s discuss what is affecting the gold market. Over the last view months, gold has increased in value despite the strong US dollar. This is not the norm, gold and the dollar usually trade inversely, so seeing gold trade higher in the face of resistance makes us take notice. We also see the current landscape look very similar to the 2016 gold breakout. Here the US Federal Reserve halted its plans to raise interest rates, and the central bank began to get more aggressive with China and how it affects the global economy. Did we just go back three years in history? This is the exact setup we see today. Okay, so how are we going to achieve a higher rate of return with the gold market? Gold mining companies often perform better than gold itself for one simple reason, they use leverage within their profit model. For those who are new to the leverage within the gold market, let me explain. Let’s say the price of gold is trading at $1300 per ounce and it raises to $1400 per once, which represents a 7.6% gain. If you own physical gold, you would have a 7.6% return on your investment. However, gold mining companies work differently. For example, let’s say a mining company owns a mine with 100,000 ounces of gold, but that gold is still in the ground. The value of that gold is NOT simply 100,000 ounces times the $1300 per once, because there is a cost to extracting that gold out of the ground. It may cost a mining company $1250 to per once to mine the gold. They have salaries to pay, machinery, and one of their largest cost is fuel to run their equipment. Here the company would only net $50 per ounce. If the price of gold now increases from $1300 per ounce to $1400 per ounce, the profit for the miners goes from $50 per ounce to $150 per ounce, that is an increase in profit of 200%! When a company increases its profit by 200%, that can have a very dramatic effect on its stock price, which represents the power of leverage within a mining company. If gold spikes even higher, this can lead to even more dramatic gains and cause a gold mining company to explode in value. Just looking back through history, we have seen this happen time and time again with mining stocks during the gold boom. From 1978 to 1980 gold tripled in value, and with it a huge gain for its owners. Every $1 of gold owned suddenly had a value of $3, but the gold mining companies performed even better, most of them quadrupling in value. Homestake Mining was trading at $30 at the end of 1978, only to be worth $107 by mid-1980. That’s a 285% return. Dickinson Mines was trading at $7 at the end of 1978, only to be worth $28 by mid-1980. That’s a 300% return. Hecla Mining was trading at $5 at the end of 1978, only to be worth $53 by the mid-1980. That’s a 936% return. The next rally happened in the mid-1990s, where the average price of gold increased by just 10%, but this increase was enough to pad the pockets of miner everywhere. Kinross Gold increased in value by 185%, and Manhattan Gold & Silver exploded by nearly 760%. Finally, the gold rally between 2001 and 2006, gold increased in value by 160%, all the while, the average increase in miners was close to 400%. Newmont Mining stock increased by 275%, Gold Fields gained 500%, and Goldcorp gave its investors an 800% boost. There is no doubt about it, even a marginal increase in the price of gold can have a dramatic effect on gold mining companies. With gold on the rise, we want to keep our eyes on the gold miners as that is where the real money can be made. All signs are pointing to a gold increase, with even a 10% or 20% rise in the price of gold, this could have a dramatic effect on the gold miners over the next several months. To take advantage of the longer-term horizon for the gold minors, we are going to sell short term volatility by selling April, and then buy longer term options in September. 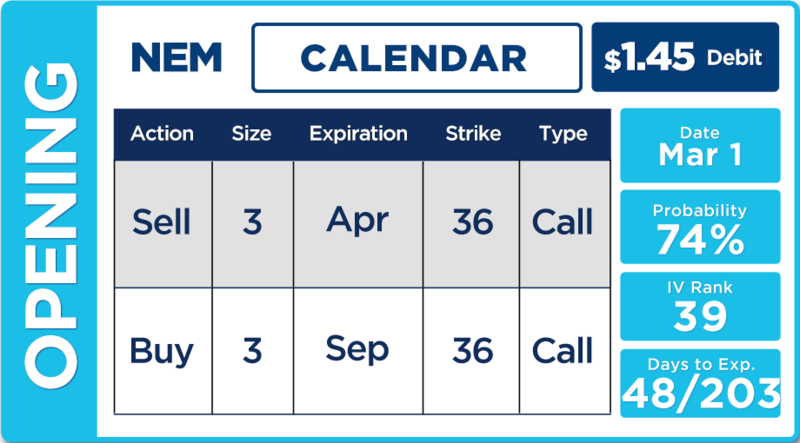 This way the April options will decay and we get to keep the credit, while we enjoy the longer term gains of September.